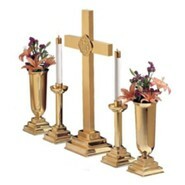 Expertly crafted for a striking display, the 30" tall solid brass altar cross is mounted on an elegant, three-step pedestal representing the Holy Trinity. Impeccably crafted by master craftsmen whose attention to the smallest of details is intended to glorify God, a polished radiance is achieved through a sophisticated urethane finishing technique that produces lasting beauty, durability, and ease of care for years to come. 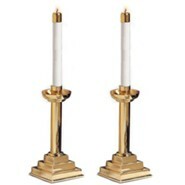 Made in the U.S.A. by a manufacturer of brass and copper items since 1947 and solely dedicated to making churchware since 1965. 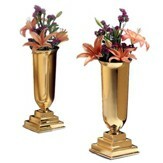 Features: 30" height, 15" width, 1" depth; Weight: 19 Lbs. Base measures: 6.25 inches. Care Instructions: Wipe with a soft cloth or wash in luke warm water and dry immediately. Never use abrasive cleaners or polishes and do not put into a dishwasher. Q: Does the 30 In. Gold Cross come in a smaller size? Does the 30 In. Gold Cross come in a smaller size? 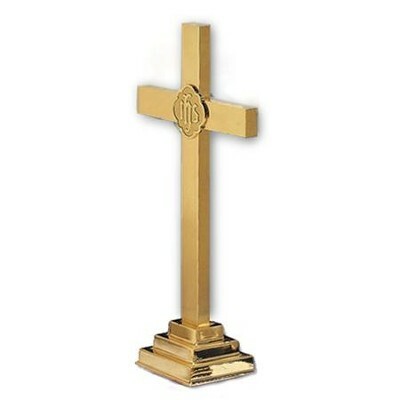 Yes, the 24 inch brass altar cross is CBD stock #WW113324. I'm the author/artist and I want to review 30 In. 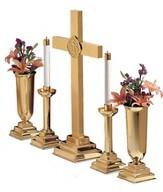 Brass Altar Cross.